Finally, Arizona is having a day when the wind blows it doesn't feel like a giant blow dryer is aimed at your face. Husband Bill is off for another fun-filled day at the office, so I decide to take Wrigley out for swim and maybe get some color. You can always tell the natives of Arizona as we are always one shade away from officially being called an albino. (Think: 'John McCain White'). I throw on my little green bikini that only the poor dog is allowed to see and we head out to the backyard. I know...this picture looks like it should be from the movie 'Fear and Loathing in Las Vegas', the way it's positioned. I tried to reverse it and it wasn't any better. But this is pretty much what Wrigley's been up to since the demise of his beloved Chicago Cubs. 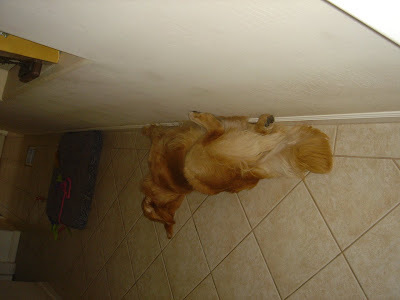 He's watched one Red Sox game and a few innings of the Rays' game, but mostly, he lies upside-down, up against the wall in our hallway! Beth: "Come on Wrigley, get up. 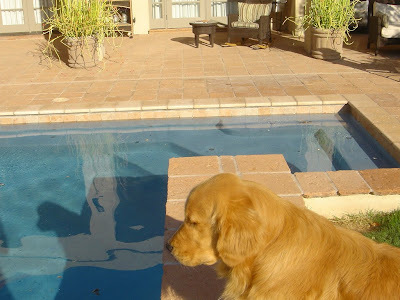 Do you want to go swimming and fetch the tennis ball in the pool?" 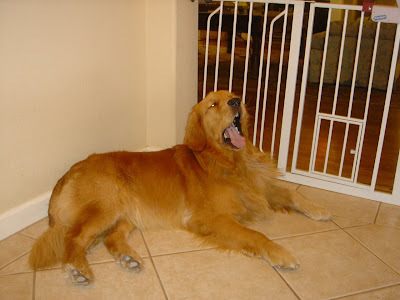 Wrigley: Groan...(stretches and scratches the wall). Beth: "Come on, I'll get in and swim with you!". This is special because when it's finally cool enough to layout, the temperature of the pool water is almost too cold to enjoy! Wrigley gets up and saunters out the door acting as cool as can be. But he's a puppy and I know he's totally excited to jump in a fetch the tennis ball. Brrr, it is kinda cold, so we both swim a few laps to warm up. I throw the ball and he dutifully swims to get the ball. Yet, even though Wrigley is a golden retriever, he has no intention to returning the ball to me. He juts by me and swims to the steps. Now the real game begins. I lunge at him and try to get the ball. 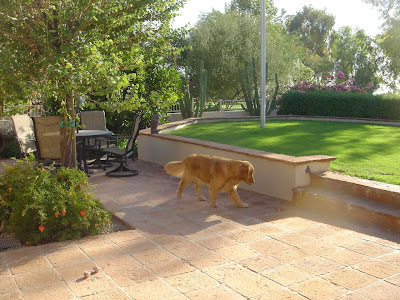 He starts running around the yard, around the furniture and up to the raised grassy area. I cut him off at the pass but just miss him. He's loving this game! We live on a golf course and I look out and two of the maintenance guys are watching us and chuckling it up and I think to myself, don't laugh at the poor dog. I check to make sure the suit is still covering all the important private parts we Americans love to hide. I capture him and he drops the ball for me. "What a good dog!" See, he's not dissing me it's just we play the game of fetch a little different than most people do. As Jen at Steenky Bee would say, "that's just how we roll". I check for color..no lines yet. I try to lay still for more than a few minutes on the chaise but it's difficult. Wrigley heads to the rose bushes and decides to chew on a rock. One-year puppies do the darnest things. "Drop it," I say with master-like authority. 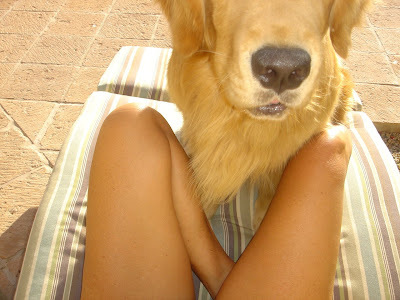 He knows not to run around with a rock in his mouth so he obeys me but decides to join me on the chaise. Oh how I love that wet dog feel as he shades me from the sun. (He's probably worried that I might get skin cancer). Time to call it a day. Wrigley's ready for his afternoon nap in the hallway.